Britain’s leading homebuilders, Barratt Homes, has named Ardent Hire Solutions as the winner of the 2017 Barratt Supplier Excellence Award for Health & Safety, in recognition of their outstanding record of service and support. The work that Ardent has done to support Barratt has been recognised throughout their organisation. 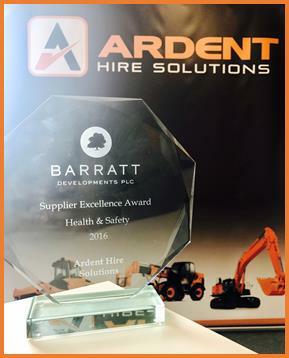 Ardent Hire Solutions are honoured to have been selected as the recipient of the 2017 Barratt Supplier Excellence Award for Health & Safety. Ardent puts Health and Safety to the fore from the very start, purchasing only the very latest equipment with state-of-the-art health and safety features. The company also has a policy of regular replacement across the fleet, keeping all hire assets as up to date, reliable and safe as possible. This focus on Health and Safety continues on site, with every Ardent delivery team fully trained to provide a full health and safety briefing on all equipment provided. It is company policy not to leave a site until the team are sure the workforce understands how to use equipment correctly and safely. Ardent are the first plant hire company to have received a Health and Safety award from Barratt, reflecting the unique working partnership between the two companies, which goes far beyond the normal supplier/customer relationship. Through shared goals and an in-depth mutual understanding, Ardent and Barratt are able to deliver a safer workplace that is more effective and more efficient.